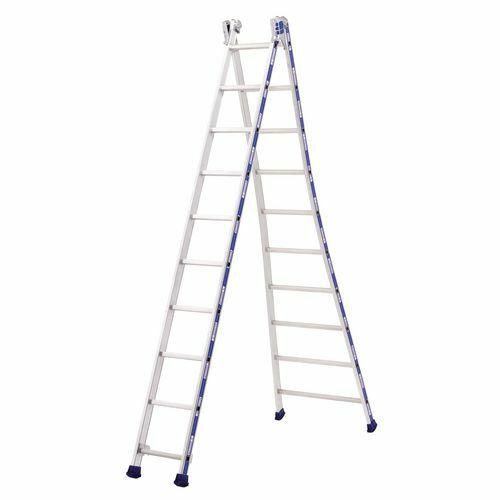 If you are looking for a flexible and secure ladder, choose our extra heavy duty transformable ladders - their two sections have light alloy castings that lock the sections together when in use. 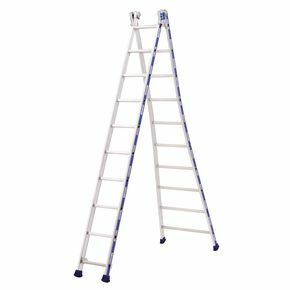 The ladders are very versatile, you can use them on stairs, as a single ladder, two section step ladder and a two section extension ladder. Their wide base gives them extra stability and their width at the top is only 450mm allowing you to reach difficult to get to areas - they are fitted with slip-resistant rubber feet and rungs, ensuring that they are extremely safe for anyone using them. Manufactured to European Standard EN131, industrial use (also GS & NF standards), they have a bright finish with polished sides making them clearly visible and they have a capacity of 150kg. Our extra heavy duty two section transformable ladders are built from aluminium making them incredibly strong, yet lightweight enough that they are easy to transport - they have a 5 year guarantee and FREE UK Delivery.